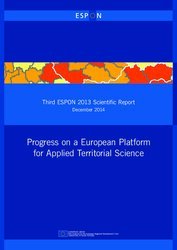 December 2014 – ESPON has promoted the scientific component of the Programme through conferences and workshops, cooperation with European organisations in the fields of regional science, geography and spatial planning, as well as with a dedicated series of reports mainly targeting the scientific community. This third ESPON 2013 Scientific Report presents achievements and developments to territorial sciences made in the 2013 Programme. It documents the progress made on building a scientific platform by refining and further developing methodologies, and it provides a valuable reference for further applied research action in the field of European territorial development. This Report presents the "use of ESPON", the most novel and innovative methods for applied sciences. This ranges from new developments related to European-wide comparable indicators on territorial developments, via quantitative and qualitative approaches to analysing recent territorial developments as well as possible future perspectives to practical territorial analysis tools that have been developed within the framework of the ESPON 2013 Programme. First ESPON 2013 Scientific Report "Scientific Dialogue on Cities, Rural Areas and Rising Energy Prices"
Second ESPON 2013 Scientific Report "Science in support of European Territorial Development and Cohesion"
One of the objectives of the ESPON Programme is to support the European wide research community in the field of European territorial science and to involve a wide European network of scientists and practitioners in the field of territorial research and its related fields. A large involvement is indispensable to get high qualified research capacity in ESPON projects and at the same time to increase interest and competences in research on European territorial structures, trends, perspectives and impacts of EU sector policy.